Bench Mark S 46 was recovered in good condition. 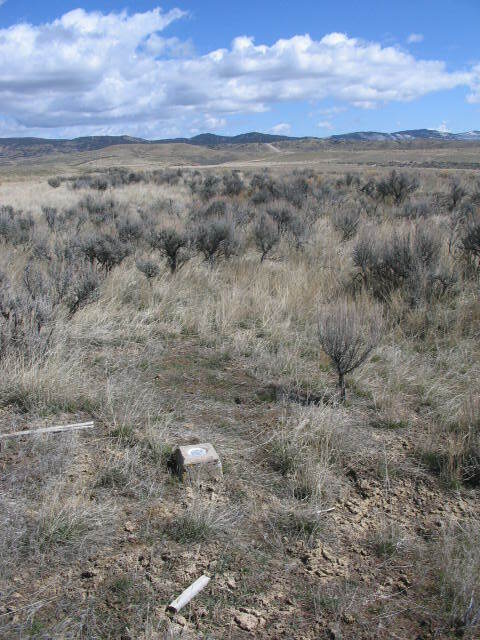 A new To Reach follows: 4.9 miles west along U.S. Highway 40 from the intersection of Moffat County Road 14 at Elk Springs to MP 32.1; thence southwest along a track road 0.1 mile to the mark on the right. Mark is 52 feet northwest of the centerline of the old alignment of U.S. 40, and 225 feet northwest of a concrete highway ROW marker. 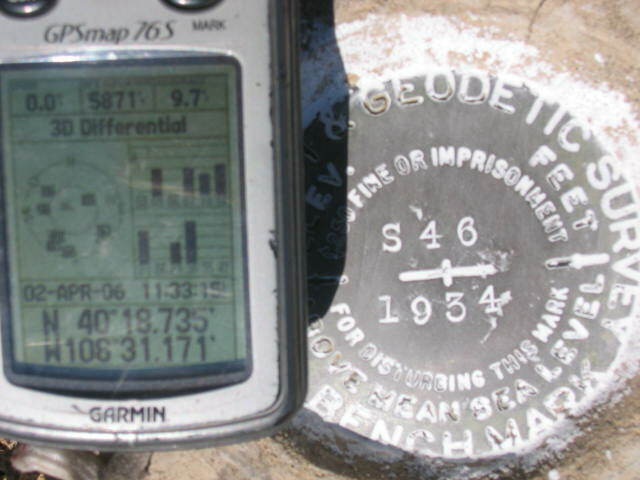 Bench Mark S 46 w/GPSr. Bench Mark S 46 from Eye Level. North at Bench Mark S 46. East at Bench Mark S 46. 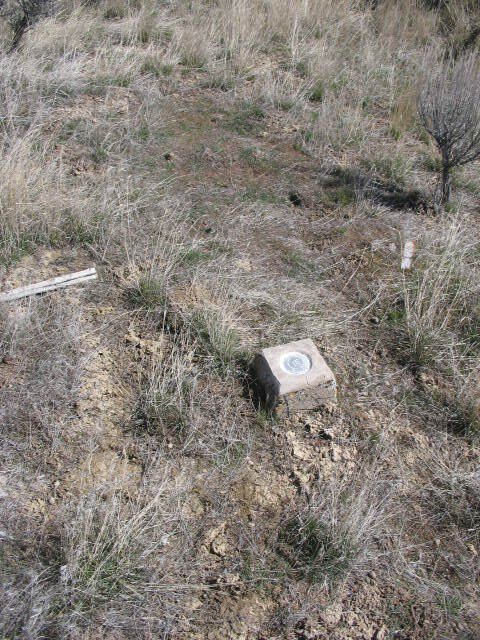 DESCRIBED BY NATIONAL GEODETIC SURVEY 1962 4.9 MI W FROM ELK SPRINGS. 4.9 MILES WEST ALONG U. S. HIGHWAY 40 FROM THE INTERSECTION OF MOFFAT COUNTY ROAD NO. 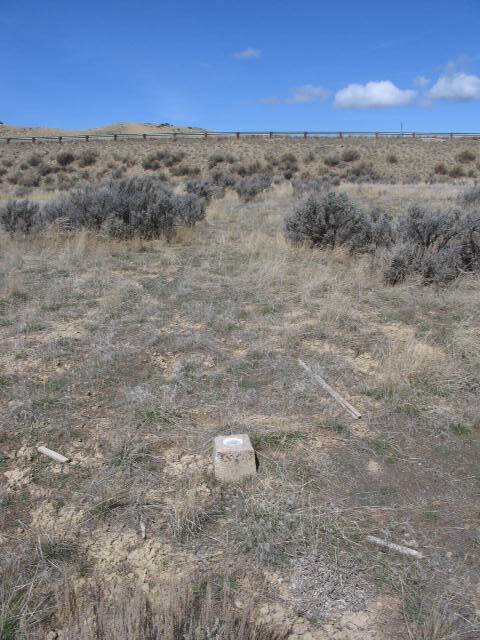 14 AT ELK SPRINGS, MOFFAT COUNTY, 79.5 FEET SOUTHWEST OF THE WEST CORNER OF THE NORTHWEST CONCRETE HEADWALL OF A 24-INCH PIPE CULVERT, 52 FEET NORTHWEST OF THE CENTERLINE OF THE HIGHWAY, AND 16 FEET SOUTHWEST OF TELEPHONE POLE 9550. 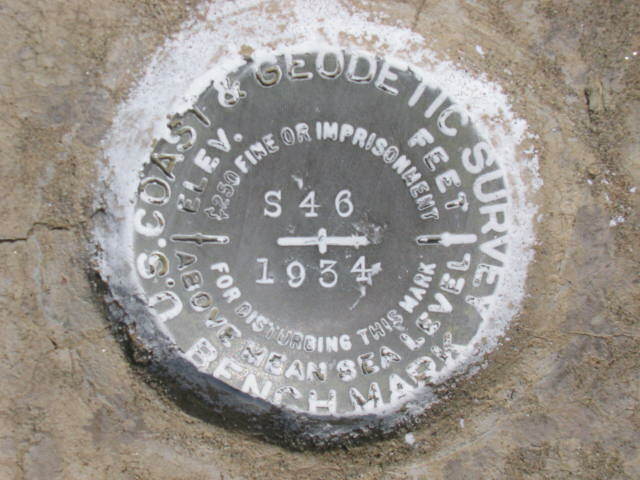 A STANDARD DISK, STAMPED S 46 1934 AND SET IN THE TOP OF A CONCRETE POST.